Tactical Lunch Kit was designed to help preserve your lunch into extreme conditions like outdoor adventures, war, or the zombie apocalypse. 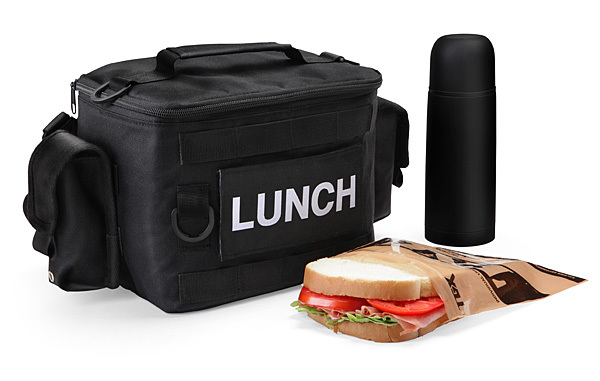 The Tactical Lunch Kit is your bag is made of durable Cardura with waterproof interior padding, it has back surface MOLLE webbing and two smaller pouches for emergency snacks, condiments, or frag grenades more snacks. Comes preloaded with a Tactical nourishment Pack and a 12 oz. matte black Thermos. The Product Specifications includes black nylon lunch bag with MOLLE straps; Patch on front reads LUNCH (attached with hook and loop); Top strap for quick grab-and-go lunch; Removable shoulder strap (adjusts from to 15" to 28" drop); 3 plastic D-rings (2 on top, 1 in front); Push-button flow control mechanism on thermos top amongst many others. The dimensions of the bag; Main bag - Exterior 14" wide (with side pockets attached, 10" without) x 7 1/2" deep x 7 1/2" tall, interior 9" wide x 6" deep x 7" tall, closes with single zipper and weighs 1 lb. 2 oz.